A two-stage Terrier-Black Brant rocket arced through aurora about 200 miles above Earth on the Magnetosphere-Ionosphere Coupling in the Alfvén resonator (MICA) mission to study the physics of the northern lights. Stage one of the rocket has just separated and is seen falling back to Earth in this photo taken on Feb. 18, 2012. A team of scientists launched a small rocket into an eye-popping northern lights display Saturday (Feb. 18) in an attempt to discover what makes auroras tick. 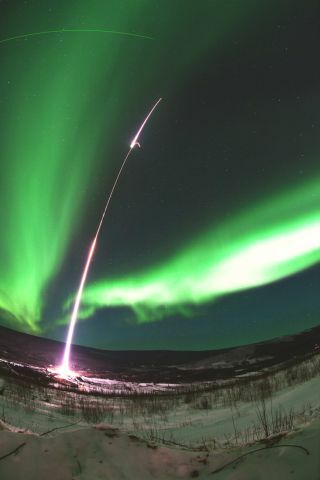 The two-stage suborbital rocket blasted off from the Poker Flat Research Range just north of Fairbanks, Alaska, and reached a height of about 217 miles (349 kilometers) as part of a NASA-funded study into how the northern lights can affect signals from global positioning system (GPS) satellites and other spacecraft. "We're investigating what’s called space weather," said the study's lead investigator Steven Powell of Cornell University in a statement. "Space weather is caused by the charged particles that come from the sun and interact with the Earth’s magnetic field. We don’t directly feel those effects as humans, but our electronic systems do." Auroras are created when charged particles from the sun hit the Earth's upper atmosphere, triggering a glowing light show. The charged particles are funneled to Earth's polar regions by the planet's magnetic field, creating the northern lights and their southern counterpart the southern lights. The sun is currently in an active phase of its solar weather cycle, which is expected to peak in 2013, and can pose an interference risk to satellites that provide navigation, communications and other services to users on Earth, researchers said. "We are becoming more dependent on these signals," Powell said. "This will help us better understand how satellite signals get degraded by space weather and how we can mitigate those effects in new and improved GPS receivers." A fisheye photo taken by an automated camera near the entrance gate at the Poker Flat Research Range in Fairbanks, Ala., as a suborbital rocket launches into the northern lights on a science mission on Feb. 18, 2012. Powell and his team used a 46-foot (14-meter) Terrier-Black Brant sounding rocket to probe a 6-mile (9.6-km) thick layer of the aurora. The suborbital rocket carried antennas and sensors to measure the electric fields spawned by the northern lights. The launch was dubbed the Magnetosphere-Ionosphere Coupling in the Alfven resonator (MICA) mission, researchers said. The scientists hope the experiment equipment will offer a glimpse into how parts of the upper atmosphere are affected by so-called Alfven waves, a type of electromagnetic energy that scientists suspect to be a driving force behind Earth's auroras. The rocket liftoff off at 8:41 p.m. Alaska Standard Time (which corresponds to Sunday at 12:41 a.m. EST, or 0541 GMT) and landed 200 miles (nearly 322 km) downrange, researchers said. A team of 60 scientists and students representing Cornell, the University of New Hampshire, Dartmouth College, Southwest Research Institute, the University of New Hampshire and the University of Oslo participated in the study. Follow SPACE.com for the latest in space science and exploration news on Twitter@Spacedotcom and on Facebook.